The Sally Lightfoot Crab has long been used as a "tank janitor" to help clean the substrate and rocks in saltwater aquariums. As an omnivore, the Sally Lightfoot is the ultimate scavenger, consuming detritus, uneaten food, algae and everything else in its path, with the noted exception of living corals. When this crab gets larger and more aggressive , it will also attack and eat small fish and invertebrates. Actually classified as a shore crab, however, it is less likely than the other genera to go on land. The "true" Sally Lightfoot species is the Grapsus grapsus found in the Galapagos Islands, which most likely won't be the one you find in fish stores. In the wild, this flat crab greatly prefers to live in areas with a lot of rocks with crevices that it can hide in. In an aquarium, it also does best where there is a lot of live rock with crevices and gaps that it can crawl into when it wants to hide, which is most of the time. The Sally Lightfoot Crab is considered to be a Reef Tank Safe Janitor as it does not bother corals, but does a great job of eating Green Hair Algae, detritus and uneaten food. Nimble Spray, Short, or Urchin Crab. This crab has a very flat carapace. Its body is brown with orange to yellow rings on the legs. Atlantic Ocean, Caribbean and Indo-Pacific. This crab is an omnivore, consuming detritus and algae in an aquarium. If insufficient food is available, its diet should be supplemented with seaweed and meaty items. 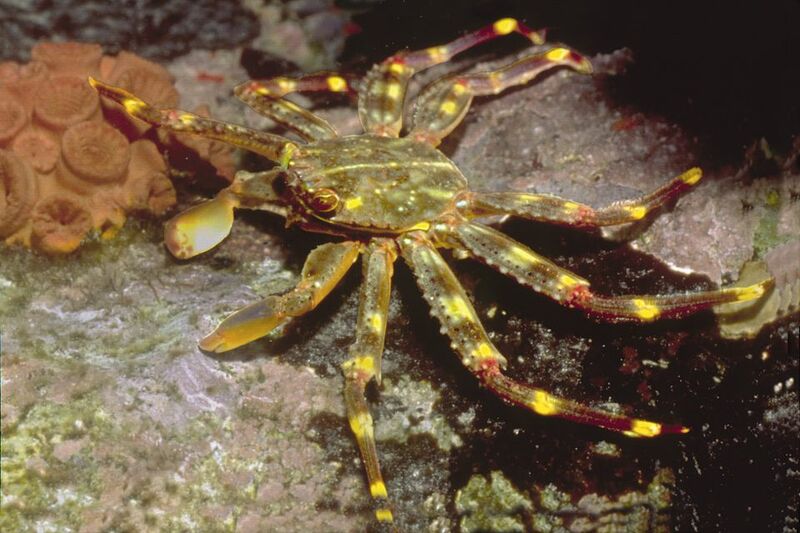 When it grows to a larger size, this crab can become aggressive and catch and eat small invertebrates and fish.